Mount Isa is a city in the north west region of Queensland, Australia. In June 2006 there 18,857 people living in the city. and 31,000 in the region. Mount Isa began in the 1920s as a mining town. Mount Isa Mines (MIM) is one of the most productive mines in the world, producing lead, silver, copper, and zinc. ↑ "2011 Census Community Profiles: Mount Isa". ABS Census. Australian Bureau of Statistics. Retrieved 15 September 2016. ↑ Australian Bureau of Statistics (25 October 2007). 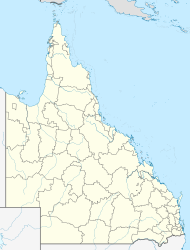 "Mount Isa (Urban Centre/Locality)". 2006 Census QuickStats. Retrieved 21 January 2012. ↑ "Mount Isa". australianexplorer.com. 2012. Retrieved 14 June 2012. This page was last changed on 25 January 2018, at 18:47.